An interesting situation occured when I was making Edna’s Kitchen Benches. I was routing a profile in the length of the leg when whilst using a Mustarka Router bit I routed over or through a knot. This knot completely totalled my new router bit in one pass. History: This was a brand new unused bit and very similar profile to Photo 1 it was a 1/4 shank, 19mm dia but a 3.2 radius. Situation: Whilist I was routing the Pine material I noticed a change in the profile, so I stopped straight away. Upon inspection I saw the router bit had lost a lot of its original profile. Photo 3. Shows a second view of the same bit. Its beyond help and is enroute to the rubbish bin. I finished the work by re-routing it with a cove bit, with no other problems encountered. I did the post as I was very surprised that a knot could do so much damage to a tungsten faced cutter, and thought it worthy of mentioning, hence the one star (now reviewed to 3 Stars as I may have given the wrong impression of its capabilities), and I will keep it to show the supplier when I buy another. I am not sure where the Mustarka brand bits are going market wise but an exact replacement one certainly is not available from the supplier. From my last PU they appear to be getting overtaken by Yonico bits. No doubt Julian can have some comfort in knowing it dosent just happen to him. Wow…sure there wasn’t a bolt hiding in that knot? Did you used pine or something similar? You gave it 1 star but didn,t mentioned how the router bit did his work before this accident. It isn,t unusual that a TC router bit get damaged on a knot. When the TC is one of a hard kind like K 10 or K 0.5 the chances are very high that he breaks. Therefor in the past only HSS was used for softwoods. Thanks Guys, here is some addititional information to review. 1. No bolts no nails, and all the timber was magnetically tested before preparation. 2. I was using pine 75mm x 75mm for the legs, here is a shot of the work area. 3. You can see the knot in the front right leg in the upper third section of the cove. 4. As for the work before the failure, it was producing a nice feature as per photo 1 so maybe 2.5 to 3 stars but keep in mind as I was not able to test the TC insert. 4. As I am not condeming the bit just reporting a “situation” and so accordingly I have increased the star rating. 5. Cost of the bit was about AUD$13. 5. In closing, would I buy another one ….yes I would. When you buy another one. A router bit with a body as large as possible is more stable. Look at the way how it’s painted. Bad paiting is mostly made in the far east. Look at the fineness of the grinding. I wish you more success with your new one. It isn,t unusual that a TC router bit get damaged on a knot. When the TC is one of a hard kind like K 10 or K 0.5 the chances are very high that he breaks. Therefor in the past only HSS was used for softwoods. Thanks for the tip, here I was thinking Tungsten Carbide was better than High Speed Steel. Suppose the same applies to saw blades – I have one where most of the teeth are chipped, some even missing. Wood knots are very hard and worse yet they are many times somewhat loose. This combination can create some pretty high impact forces. Also, the design of the profile has some fine detail that are more susceptible to fracture. Unfortunately, tungsten carbide is very hard and cuts well but can have impact failures. It is not possible to know if the bit had a defect or not. But when you route a piece of wood with a knot, you should know that there is a risk. If the knot or part of the knot is loose you risk a problem. I know others who have damaged planer knives on knots. Be careful of hurting yourself. Rob that’s quite a dramatic looking blow out. I’m wondering? Do you think a slower speed setting or slower feed might have avoided that. I have doing dovetails and on advice of the customer service rep at Whiteside, I slowed the speed of my router and got much better results. It’s good to note that you did not mention any injuries. 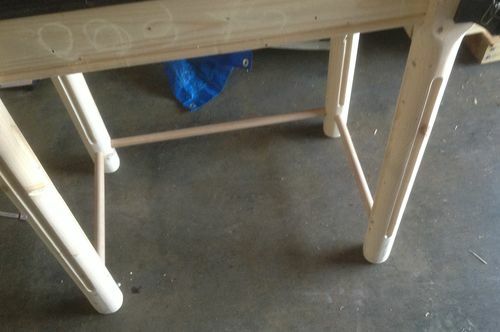 I had the legs set up on a router table and the bit was contained within the cut. Never the less I could not find any “bits” later and all I noticed was a change in sound and feed rate then obviously the result later. Daily I have seen broken TC tips, in particular by saw blades. somethimes 5 or more damaged TC tips from one saw and never heard that someone got hurt. The tips probably disappear in the material or in the extractor.